Emily Thorne's open floor plan beach house from Revenge offers four distinct living areas including: the kitchen, the dining area, the den area and the formal sitting area. You'll find her infinity box on the coffee table and her laptop on the kitchen island. Her lushly landscaped property features a patio with grill and access to the beach. A wrap around porch offers excellent views of the ocean and a quiet place for taking a break from plotting revenge. 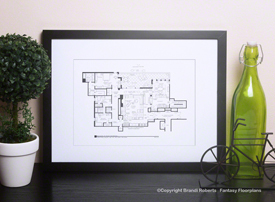 Pair with the second floor of her Revenge TV home for the complete set!